The morning was crisp and inviting. How many rides do you know of that start like THAT in August? At least not here, in the midwest. This is the strangest August weather since...gosh, C'dude III back in I dunno, 2004.... 50's and fog is all I remember. This morning was close to as-weird. Today, under a full moon and clear skies, ugh... can't get much better. Just barely chilly enough for arm-warmers, and a few jackets were seen at the start line. 36 riders showed up from many places around the midwest, as far north as Des Moines and east as Columbia... that's right, the Colonel was in the house, Mr. Clinkenbeard, the soldier, the legend. Spencer K. was there, TriMike from Grandview, Jeff W., Fine Jewelry was there, and a host of other semi-familiar faces, too. New guy Jason B. was also ready to go, this being only his second 200K event ever - and he RODE HERE from Lenexa! A great day for a brevet was shaping up, and the crowd was stellar. This ride was part of a nationwide event marking the 10th Anniversary of the formation of Randonneurs USA, or RUSA. Everyone riding was eligible to receive a special medal for completion, so the turn-out was near record-breaking! Bob, one of the original group of charter RUSA members, started off giving us the full condensed history of RUSA, and went over the rules before sending us off into the predawn light. Before long, it was taillights and the clicking of pedals and shifters. Lots of cool bikes in the mix -- from Clink's Ti Litespeed with racks and bags, to a Cervelo P3-SL, a Trek 6.9 Madone, to a couple of full steel tourers, and several tandems - including a simply magnificent Calfee custom full-carbon tandem. I never got around to asking how much it weighed, but it was magnificent looking. Right off the bat Jason and I managed to stay together, and that would set the tone for the day -- he's a very strong rider and we end up being pretty well matched on the road, so it's perfect. On 78th Street, headed down towards the river, everyone is bunched up and chatting away. It's a great morning. I don't know how else I can put it without sounding like a broken record -- the August weather overthis last week has been dry and topped out in the mid 80's. It's simply weird for us to not be bursting into a rolling sweat at 6AM because of the oppressive heat and humidity. Everyone was simply elated, smiling ear to ear, and humming a happy tune because of the excellent conditions. Even later when facing an east headwind for the return, my motivation was top notch. It was simply PERFECT weather. Ok, I'll can it about the weather for now! The first part of the ride saw early moves and advances by the "fast group" which was dominated by the boys from Grandview -- I mean, they were simply GONE, taking full advantage of the slight tailwind and flat roads, and by the time Jason and I turned onto K-32, we couldn't really see much of them anymore. There would be no catching them today. We then found ourselves where I usually find MYself -- stuck in no-man's land, firmly between the fast guys up the road a mile, and about a mile ahead of the next fastest group...but it wouldn't last too long, as the larger group behind us, containing two tandems, began to advance a little bit. After a few miles, and right before my FAVORITE railroad tracks in the world, the catch was made. For a long time, after safely crossing the tracks, we managed to stay in relative contact with this new group and enjoyed the fruits of the paceline for a while -- something I haven't taken part in for months now. It was pretty nice! I love this part of the route, here, after getting west of Bonner Springs on old K-32 highway paralleling the railroad tracks - which since the last time I'd ridden this stretch have gotten pretty busy. Rail commerce is on the upswing again, which I like. Eventually, the first hills of the day are upon us as we turn south up on LV-1. The first test -- well, not really. It's not like I haven't been climbing anything lately on the Border Patrol perm route, so these are truly nothing to worry about at all. Just good fun, and great scenery. The grass is green, the trees resplendant, and the butterflies are out in force which is a cool byproduct of the marvelous weather. The sun finally peeks out, and the temperature starts to rise into the promised mid 70's and lower 80's, and the smiles continue. The first control, I'm pretty pleased. Most of the fast group is still there, and soon other groups come piling in behind us, and the c-store parking lot fills up quickly. Jason and I make quick business and get pretty much right back on the bike and head out after only a few minutes. It's a productive control, which sometimes isn't normal for me -- but this one only being 20 miles in, it's a little early to consider stopping much. Back on the road, we enjoy the last section of K-32, and then turn south towards Eudora, KS on the continuation of county road LV-1, enjoying a nice long downhill in the process. During the next several miles, events would unfold that would set the tone for some solid training. Eudora, a little burg on the edge of the Kansas River, which we crossed at a good clip as a group. As we rode along, I really REALLY wished that I had a good camera in my stable. Something small with a good, fast chip and excellent optics. As we crossed the bridge I looked to the west onto the waters below and saw a perfect sun angle casting the shadows of our paceline onto the surface. It was truly picturesque, but my shoddy camera phone wouldn't have done it a lick of justice. A good camera is on my shopping list, and until then most of these opportunities are held only in my memory. Also something that would have made an excellent shot was a gentleman on a very well appointed A. Homer Hilson bicycle from Rivendell - say what you will about them, they are special machines with a strong mystique and superb finishes applied with care by Joe Bell. This one was outfitted for action, with a modern crankset, full fenders - including the rear 1/4 fender add-on hack which looked very well executed here. The brilliant blue was striking with the grey road surface as a backdrop - truly fantastic, and definitely a bicycle that gets USED, not just a showpiece. In fact, the only Rivendell owners I know really use the heck out of their bikes. I'm not sure where the diaper-rubbing, coffee-table art notions about Rivendell owners come from, because I haven't seen it. I still wouldn't mind having an Atlantic someday -- perfect in nearly every way, but with more tire clearance than the Kogswell. Ahhh, dreams. Shortly we were stopped by a freight train on the other side of the river, and the majority of the pack began to regroup. It was a nice rest, and kind cool to see the train pass. We carry on thru Eudora, and then meander across the under-construction bridge over K-10, and head south on what becomes DG-1061 highway. For the next 12 miles, the pace would slowly get lifted by the tandem, and then the trio from Des Moines - a group that I would call, the Three Hammers. Since I don't know their names, and am terrible with them anyways, I'll just refer to them by bicycle -- the Cervelo P3-SL, the Trek 6.9, and I believe an older LeMond. These three were strong riders - and when I made my way to the front of the group to take a pull, the pace slowly started coming up... and up....... and up a little more. Pretty soon, the guy on the Cervelo would inch up... then I'd inch up... back and forth.... the beginnings of a great double paceline. Unfortunately, I don't think either of us looked back to check and see what we were doing. As DG-1061 unfolded, mile after mile, we hammered -- pretty soon holding steady at about 24 MPH. I could feel the armor around my legs starting to crack a little, but I was holding on - for the first time in a while, I was pushing a pretty good pace. The Cervelo guy was relentless, however -- and ever so slightly he'd inch up, and something in me screamed "answer! ", and so I'd try. Totally forgetting what kind of ride this was, forgetting who was behind us -- who was actually WAY behind us. The tandem was dropped, the other couple of cyclists were dropped, and the only ones remaining were myself, Cervelo, Jason, the Trek 6.9 and the LeMond. We were FLYING, now holding at around 26 MPH. Now, where cracks were forming in my legs, there were chunks of concrete falling away -- the breath was getting heavier, the effort beginning to take its toll. MAN I was gonna pay for this later...only 40 miles into the 130 for the day. What the heck am I DOING? Pull off! Pull off!!! But no.... that little voice... the same little voice that I haven't heard for many years... was still telling me to hang. Fight! No excuses, no complaining about the gut, the past, the weight issues - whatever, just shut-up and PEDAL!!! After about 5 miles, the first test was coming --- with a very slight tailwind and fairly flat roads, you could say that we were having it easy...tell that to my legs... but up ahead lay a hill. Nothing huge, nothing unmanagable, but at this pace it was going to be interesting. Downtube shifters, I would have to make my choice early. The legs were burning now, leaving big hunks all over the road, and this hill was going to shake it all loose and throw me over the edge - but I had to try. BOOM, the grade came on slow, but it was immediately impossible to hold the same pace... for me, that is. The Cervelo, the Trek, the LeMond - one by one they began to ascend, and I jumped out of the saddle to answer and simply couldn't. I got dropped but HARD. I still managed to shove out the rest of the climb, initially picking too big a gear, and then too small of one I ended up spinning my way up and over to the downhill on the other side, only to see the three riders about 1/4 mile ahead already. Jason was instantly next to me... and it reminded me of Del down in Texas back in February. "Got that out of your system yet?"... or something to that effect. This time, however, after conceding verbally, I found myself shifting up again and getting into the drops. My legs were on fire, but so was my spirit - I was not gonna let these three go without a fight, and US-56 was coming. I had five more miles or less to catch them. And soon, that's exactly what I did. Now, RUSA rides are *NOT* about this, but a little honest competition and good training never hurt anyone. I can't honestly tell if they had let up the pace at ALL to let me latch back on so the fun could continue, or if they were still hammering -- it doesn't much matter, because it took a good portion of my reserves to catch back up. Jason was still in tow, too, really enjoying himself and pushing his limits in the process. If I ever want to get back to form, get back to the point where that hill would NOT have dropped me, then I *HAVE* to chase. After about a mile head down, I was back in the hunt, back up front with the Cervelo guy, and the road was not flattening out much. Instead of the long flat sections that made up the first five miles of this road, this section was a little lumpier - and I found myself recovering better than I had on the first hill. We were not going quite as fast, but pretty soon the game of pace-raising was starting all over again. This was PERFECT training... slowly adding coal to the fire until I just run out of oxygen. As we rose over another roller, I spotted targets up the road -- we were catching someone from the fast group up ahead of us! Dang... This was the fastest I had covered ground in a while. The five of use continued for another two miles or so, and I got dropped off a little once more, but managed to catch up again a little faster than before. Man, this is hard work - and the Cervelo guy was not letting the front go at all, a real fighter. I tried a couple more times, but the push was leaving me again - and finally there was one last accelleration from the trio, and they were gone again on the next rise. Jason, once again, came up and asked if I'd had enough... a slight pause.... NO! For the third time, I dropped down, sucked it up, and gave it one more shot -- but then I lost my steam completely and grunted aloud, shouting. There was the huge stop sign announcing US-56's intersection. I'd lost the "race" to the highway... what I gained, however, I won't know until after I recover. From now on, this ride was gonna go along at a more reasonable pace. OR NOT! The graffiti on the stop sign said it best.... "Hammer Time", props to M.C. Hammer, which made me laugh out loud, and on the other side of the highway I dropped down again and shifted a few times for one last run. These guys were probably getting really tired of seeing me, because one of them likely had a rear-view mirror on their helmet. At about 50 yards back, they all turn around and see me coming. This time, it's officially time to thank the Cervelo guy for the good training and complement his riding - because that last little burst was all I had left. Wellsville was coming, with brick streets and old buildings. Jason and I back together on the road, back at a reasonable brevet pace, time to enjoy the day. After the bone jarring trip past downtown Wellsville, we meandered out of town and out to Shawnee Road towards LeLoup, KS., and then down towards K-68 for the last leg to the turnaround control. Along the way we were joined by a guy on a gorgeous Seven Cycles bike and we chatted for a while before he advanced up the road. Tennessee Road was next, crossing over I-35, and finally to K-68. Just as I remembered it, the shoulder exactly the same. That's all I have to say about that! The only excitement was confirmation of how badly we STINK compared to the incarnations of cycling greatness that live among us. The FAST FAST group, the head of the ride finally makes itself seen at about Ohio Road and K-68, probably four miles from the turn-around. Yup, despite all the super-fast-action on DG-1061, we were still 8 miles behind them -- not including whatever time they'd spent at the turnaround control. Make no mistake: I AM NOT FAST. Do I want to be, absolutely.... but there is a LOT of work to be done. Ottawa comes quick, and the Casey's station! Whew... halfway! Bob is there with 10th Anniversary cake, too... but I pass on this round. I've learned about my stomach. Ya'll know. Time to face the headwind, and see how nasty it is. Well, it isn't at all -- it just feel good, a nice breeze. Yup, I'll say it again: a perfect day for a brevet! The rest of the day can be summed up by puffy white clouds, a good slice of pizza back in Wellsville, good conversation with Spencer, the Colonel Clink, Bob Burns, and Jason. Mild breezes, some shade, some sun, excellent roads, a scenic detour of Eudora, some more fast action on DG-1061 as Jason gets "done", some fun on some hills that I've never climbed before on the return to Golden Road, more railroad action on K-32, ice cream dreams at Bonner Springs, the flat flat flat flat flat road between Bonner and Edwardsville, Spencer's flat tire, and finally climbing the three-mile long climb of 78th Street alongside Danny "Colonel" Clinkenbeard, the legend, the only rider in RUSA to have done every single 1200K in North America - four of those in one year. To share time on the road with this man, the stories, the character of him - it's a privledge. We climb together up this long grunting climb, and finally he lets out a honest holler at the heavens when we reach the top. It's an awesome finish to a really long, tough ride. Actually, for a couple hours along the road today I got to share some miles with Spencer and Danny - both legends, really, in the RUSA ranks for their exploits and endeavors, rightly so. They are planning a very big adventure that departs from Sacremento, CA. on the 24th of this month... the longest RUSA permanent on the books, one of Spencer's own design: The Pony Express Permanent -- 2,979 kilometers from the coast back to St. Joseph, MO. The arrival time is planned to coordinate with the start of the Tour of Missouri up in St. Joe, so it will be a sight to see, media coverage, etc. As soon as I have links to follow the action, I'll post them here. Covering almost 14 days, it's one to watch! That's all I've got for ya -- Another step towards R-12 complete! I'll be riding the Super Big Gulp permanent, followed immediately by the Kansas City MS-150 tour. That oughta be interesting! I have given these tires 1800 miles before officially reviewing, and I'm very impressed. Over the 1800 miles I've used them, I only flatted once (er, twice?) Details: Back in March on the 217km brevet, in the rain and snow - I was in the wet for about 70 miles, and under those conditions that's usually the death march for any tire. I discovered the double puncture (two individual punctures, about three inches apart) upon reaching the turn-around control. The tire didn't go flat on the road, and I only noticed it was soft as I rolled into the gas station. I thought, "great, so much for that Armadillo stuff..." -- but upon patching the tube and extracting the offending debris, I discovered that the punctures were caused by these really long, needle-like sharp objects - not sure if it was glass, or some kind of shard of plastic -- in ANY case, this would have worked its way into ANY tire, I think. I patched the tube, and finished the last half of the brevet without incident...and I haven't had a flat SINCE. The flat occured in the first 200 miles of the tire's life. 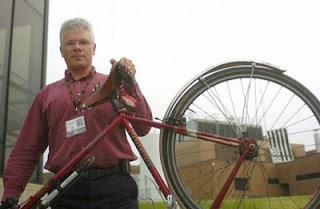 Honestly, based on the evidence on the tread, I have had LOTS of opportunities to flat these tires. There are pits and cuts, and I've had to dig pieces of glass out of the tread, but NOTHING has managed to puncture the belt or the tube underneath. At 1834 miles, today on the way home, I hit a gnarly chunk of something on the road, and it caused my bike to do a side-skip it was so large. The result is a 5 sq. mm FLAP of rubber just hanging on by one side where the cut occured - underneath is the casing of the tire, fully visible -- but NO FLAT. It's almost like, "should I keep riding this??" It's pretty awesome, actually -- I filled the "hole" with some silicone-based sealer (call it an external boot) and will let it dry overnight. Not sure if that will do ANYthing, but that should give you an idea of the level of confidence I have grown with these tires. Rub some dirt on it, and ride on. Considering the thickness of the rubber on that leftover flap is about 2mm or so, there is actually quite a bit of tread left, and I'm guessing my orignal goal of 2,500 miles on the rear might actually be possible. I will defintely buy a new one, and rotate the current front tire to the rear. That will squeeze every last dollar out of it, and that means roughly 4500 miles on a single tire that begins life on the front of the bike, and gets rotated. Not bad for a "sport" tire, as opposed to a touring tire like a Schwalbe Marathon. The feel is good, spry, and nimble - I feel like I can corner harder with more entry speed than on previous tires. I like this "racier" feel of the tire, compared to a Panaracer Pasela TG, for example - and I like the way the tread design doesn't hang on to small rocks and such - which I feel is a contributor to flats in some cases on other tires I've tried. These tires don't have that issue. They are very good in the rain, even slick mud on the paved trails after rain, and they roll plenty fast enough to "hang in the pack". Weight, who cares with this kind of consistency? Not I. They are actually HEAVIER than the Panaracer Paselas they replaced -- but because my number of flats per mile has plummetted, I no longer care about that difference in weight - and consequently, the tread pattern and design of the sidewalls, etc., it still feels like a faster and more nimble tire than the Pasela, despite the weight. My only shortcoming in this review; I haven't ever tried the All-Condition Armadillos (without the "Elite" distinction), so I can't advise if the newer "Elite" feels better, rides better, etc., than the "regular" Armadillos -- but, I can say that these are SUPER comfortable, very comparable to a Panaracer Pasela, my old benchmark - so, again, since there is only a small penalty in weight (25 grams?) compared to the Paselas, they ride just as good, and they "feel" faster - I feel it's a winner. Defintely worth the price, durable, fast enough, and nearly a mount-and-forget tire. The first two flats? A fluke - nothing is flat-PROOF*. These are darn close. *except the Schwalbe Marathon Plus - but the flats-per-mile to weight ratio on the Schwalbes gets knocked down, because they weigh (gulp) 710 grams a tire. The Specializeds hit the scale at 305 grams which is impressively light for the protection you gain. The Pasela's are still a fantastic value, and the flats-per-mile vs. weight vs. COST - they win, hands down. At 280 grams and usually found for $19.99 a tire, they are a terrific value -- but I found myself getting flats often enough to make me consider something else. Considering they don't have bead-to-bead protection, like the Specialized's do, that displays Specialized's technology at work. Still, I havetalked to others that have gotten 5,000 miles out of a SINGLE Panaracer, I have never managed to do it - in fact, the farthest I squeezed out of a 700x28 Pasela was 1,650 miles on the rear before it was SO thin it was getting me a flat every other day. My specific territory, patterns, habits, etc., yeah -- this is a very personal issue, just like saddles and such. But, like all reviews, you must take this subjectively - I have to admit, the Pasela is a fabulous tire, and there is no reason to try anything else. But, if you like a certain kind of feel that you only seem to get on your weekend bike, then these tires can provide a similar feel with the protection you require when commuting. For me, it's the best all-rounder I could find, and now that it's decision time - and even though prices have gone up thanks to the oil industry - I will likely buy another one, and do my rotation. The real test will come this winter, with salt, sand, glass, and more of every kind of debris everywhere I ride. But, if these keep me on the bike and not freezing my fingers changing a flat, I'll take it as the price of confidence. Well, I never woulda thought that it rained THIS much, but apparently it DID. In some places in the south metro, there was up to 8 inches of rain recorded OVERNIGHT from Tuesday evening into Wednesday morning - and for the first time in many years, the major creeks around the area were flooded well out of their banks. In the older Indian Creek section to the north, it would usually get pretty bad - but the Tomahawk section to the south was usually okay. Not so this week. Tuesday AM, it was raining pretty good, so I decided to stick to the main roads. Tuesday afternoon, the same deal - and then Wednesday morning was practically a monsoon, and I knew better than to even try... took the roads again. I hadn't been on the trail in a couple days, then, until Thursday afternoon on the way between jobs I decided it had been "long enough" for any water to go down. I was close... quite close to being exactly right. We're not talking about anything MAJOR, like road destruction or washed out bridges -- without stepping onto the soap-box for TOO long, you'd have to disrupt automobile traffic to have something be considered "major" news. Still, the City of Overland Park has a lot of work ahead of them in clean-up, which is appreciated. After passing a section of trail that had the top layer of bitumen blown off the previous, and tossed like trash into the adjacent bushes, I thought to myself that there might have been a lot of water through here... then I turned the corner and saw the above. 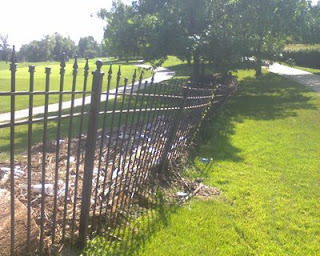 This is a heavy wrought iron fence that has been pushed over a bit, and is loaded with debris. Check out the size of the log in the bottom left foreground of the shot. I have to apologize -- my camera that's built into my phone isn't top-notch -- or it's SO humid that the haze is just apparent in each of these shots. Another fence bites the dust -- this one not quite as robust, it's all the way over and choked with debris. 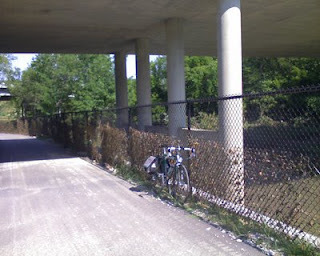 It trails all the way downhill under the bridge that crosses underneath Metcalf at about 133rd Street. Note the mud that has dried on the trail surface. Thankfully, OPPR had already been thru and has bladed most of it away. Metcalf itself is on the same elevation as I am in this picture, so you can see the water wasn't too awful far away from the road - but it wasn't quite over the bridge itself, shy by only a couple feet, I'm told. Here the debris line is apparent on the chain link fence that was just installed only a couple months ago when this new section of trail was finished. This is directly underneath US-69 highway - and yeah, the highway wasn't in any danger, but that's a LOT of water. I would have been swimming had I tried to ride thru here 24 hours earlier. From the same area shown above, this is looking thru the fence down to the water. It's still up quite a bit, too. Normally, its barely a trickle running over the underlying bedrock. Today, it's moving quite fast, and still probably several feet deep. 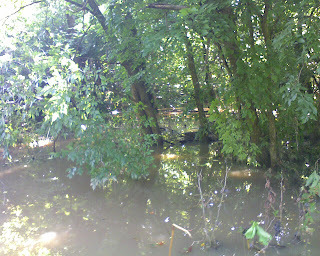 Still, the water has fallen nearly 12 feet from where it would be even with the trail surface. A lot of water, indeed. Here is a section that looks like it could have been snapped in the Georgia swamps. Looking far deep into the photo, the water extends really far back into the woods. This is roughly between Antioch and Metcalf, and close to I believe 137th Street - a place where the trail goes back on its own and doesn't really parallel anything. This is looking west, and the main creek is behind me. This is normally a BONE DRY ditch that goes under the trail and feeds into the creek. 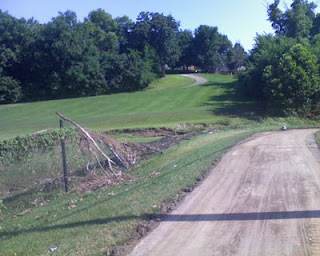 The bed of that ditch is an eight-foot drop down from the trail surface. Although I didn't get it in the shot, the water is right up onto the edge of the trail here, and therefore, eight feet deep, approximately - and just STANDING. 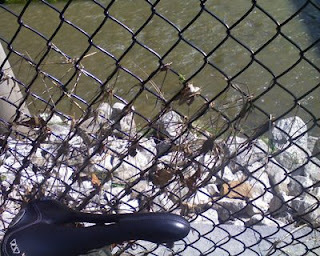 The feeder under the trail is probably clogged with debris. This was taken Thursday afternoon. Friday afternoon, the water was only about a foot lower. It smells WONDERFUL, too. I took a pause from the carnage of the flood to ge a shot of this marvelously restored Farm-All tractor that is parked at the back property line of the Deanna Rose farmstead park. The workhorse of yesterday becomes the backdrop for my workhorse of today -- although I have to remember that a picture like this might not be too far out of the question. 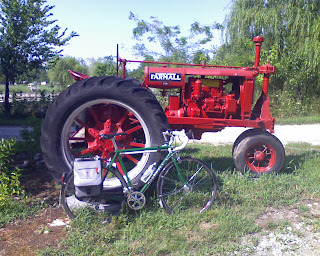 The bicycle isn't exactly new, and tractors aren't exactly antiques. But, still -- I like it. If it was a John Deere, you might not even be able to see my bike! Although it's muddy here, there isn't anything to suggest the water was this high, although a fence about 500 feet behind me on the trail to the east was knocked down, so parts of the farmstead were probably messed up a little. The fence that, last week, seperated me from getting a shot like this was also missing today. And while I'm on the subject of thanking the City of Overland Park for their efforts in cleaning up the trail and the surrounding area, I also have this to thank them for***(see note). This is 143rd Street, between Pflumm and Blackbob roads, Thursday evening. Thursday morning, those bold white stripes were NOT there. NOW they ARE. After YEARS of campaigning, bicyclists are finally making some good headway. Something Overland Park said they would likely not do, we now have a bike lane - marked on the road surface, and as I write this Friday night the improvements continued - today they added the bicyclist sillouhette marker inside the lane, making no mistake about what it is there for, and signage announcing the fact to drivers. I can't say that I feel any safer, because I've been up and down this stretch for three years now - but new cyclists certainly will, and drivers will know what's up. Besides gas prices, that is. I was so elated that I stopped to take a picture of it, and didn't even notice that I was also catching a 70's Corvette in the frame as well. In fact, I didn't even notice what kind of car it was until I reviewed these photos this morning. For me, this is huge -- I grew up in the car culture, as we all did, I suppose -- but, my Dad subscribed to Motor Trend, Car & Driver, Road & Track, Automobile, Hemmings Motor News, Super Chevy, and more. I grew up totally soaked in a thick lather of cars, cars, cars. I worked on em, drove em hard, took road trips for no reason, and worked 12 years at a wholesale auto-parts supplier. For me to give up on cars, that's a big deal. For me to not even notice a Corvette approaching me on the road... well, my Dad would be sad, but proud at the same time, I think. At least I can still pick 'em out of a crowd - but it wasn't the subject of the photo. To think of what my grandfather grew up with: seeing a recent picture of him when he was maybe a few weeks old, the family perched in front of their "unknown" truck (they all looked alike in the late 20's) -- the car, only recently invented and made affordable enough for everyone to attain, it was prominently featured in family photos as a matter of pride and societal placement. It was a big deal. My Dad, growing up in the age of American Grafitti and James Dean, cars equalled cool - he drove all the greats; Mustangs, GTOs, big Buicks with big engines, eight cylinders was a minimum - well, until the gas crisis in the mid 70's that is. Then, cars became more sensible in the family driveway - but still good ones. I had high aspirations growing up -- someday, *I* will have a nice car, too... and I've had some nice cars, but mostly decided out of neccessity, not out of true desire. Certainly not the way I see pictures of the 2009 Corvette ZR1, and drool... only for a moment, knowing that EVEN if I could ever hope to afford such a luxury, it gets gas mileage in the single digits. Looking at the way I view the world now, I know that dream had changed - and I'm realizing it after the dream has changed of its own accord, spurred by my actions over the past few years - commuting, and spreading the word and seeing more and more bikes on the road. As exciting as some of the 2009 model year cars are, I get more excited about the 2009 Dura-Ace, and that new single-speed mountain bike that will fit fenders and studded tires - and might get me thru the winter. It's interesting that in only perhaps one more generation, those proud photos of "hey, I just bought a new car!" may not even happen anymore. It's hard to tell, but I think MY kids are on the brink of the twilight of the car culture - at the very least, as we know it today. I'm not sure how I feel about all that - it's a concern bigger than these blog pages; a concern for the manufacturing base that helped weave the fabric of this nation, yes including the oil industry. What will we do as a nation? It's an interesting time. And here I am, getting excited about a simple stripe of paint on a road. It represents, to me, something of a finality, an admission by the powers that be - someone had to sign something for that line to get painted. Someone that perhaps two years ago, didn't want to. Now, perhaps, they felt compelled to. The same way nature had decided the path I took to work over the last three days, nature is also deciding the future for us. It's an exciting time to be alive - and view it as you will... exciting is not always neccessarily equated with positive events. Getting laid off from Ford...that is "exciting", too, for different reasons. The next five years.... the more stripes we see on roads, the more change will come - and it will bring a flood of excitement. 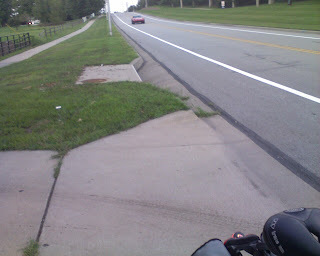 ***and the idiot award goes to me for temporary insanity: the new section of bike lane, even as I typed it out at 143rd street between Pflumm and Blackbob - that is still in Olathe city limits. Overland Park doesn't pick up the tab until after you are east of Pflumm, where the road narrows down to old two-lane country-style roads until you reach Switzer. 143rd is slated to be improved and widened in 2011, I believe, and at that time a lot of pressure will come to bear on Overland Park to make sure there are bicycle accomidations involved. For now, the prize goes to Olathe - but to be fair, Overland Park's portion of 143rd near Pflumm isn't wide enough to allow for an extra stripe, so they technically get a pass until the road improvements begin in a few years. But, I did mis-state the original atricle, so I apologize for the confusion.